VAUGONDY - Partie saptentrionale du cercle de Haute Saxe [?] Brandebourg. VAUGONDY, R. de - Partie saptentrionale du cercle de Haute Saxe [?] Brandebourg. Title : Partie saptentrionale du cercle de Haute Saxe [?] Brandebourg.. Date : Paris, c. 1760. Size : 18.9 x 21.3 inches. / 48.0 x 54.0 cm. 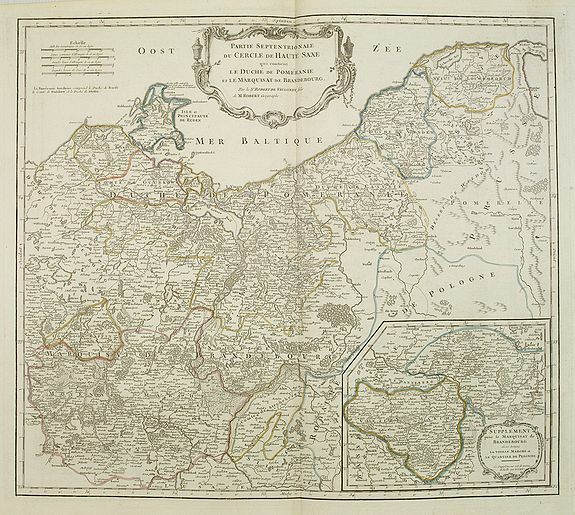 Description :Finely and crisply engraved map of north eastern part of Germany, including inset map of Brandenburg. Map by Giles Didier Robert De Vaugondy with erased title cartouche..
Ornamental title cartouche in the upper part of map.